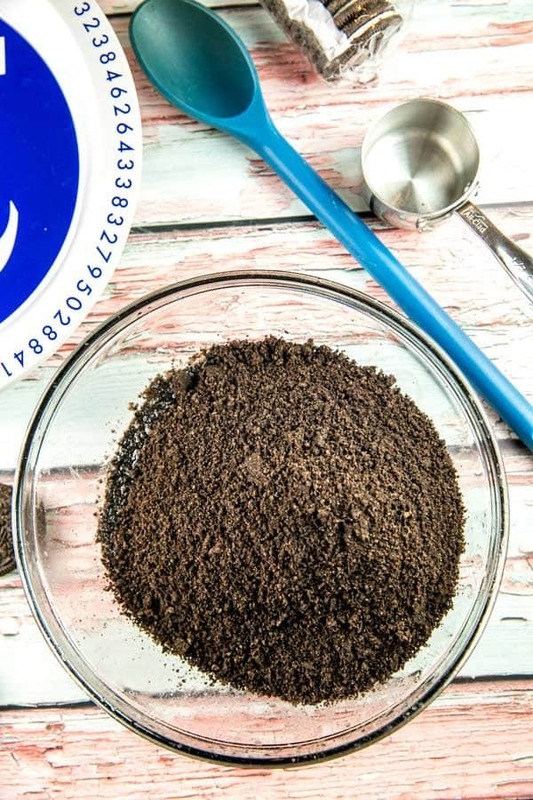 Start crushing up those Oreos – it’s time to make an easy, no bake, homemade Oreo cookie crust! Skip the premade crusts and make one yourself with just oreos and melted butter. So easy, a 2.5 year old can do it! 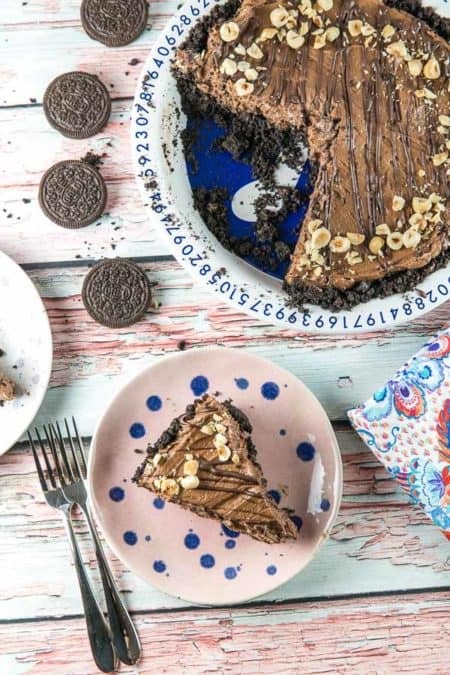 Plus, suggestions for what to put in your newly made Oreo crust. As part of my Pie of the Month series, it only seems fitting to also share recipes for my favorite pie crusts. I’ve already shared my No Fail Pie Crust (for a perfect pie every time!). 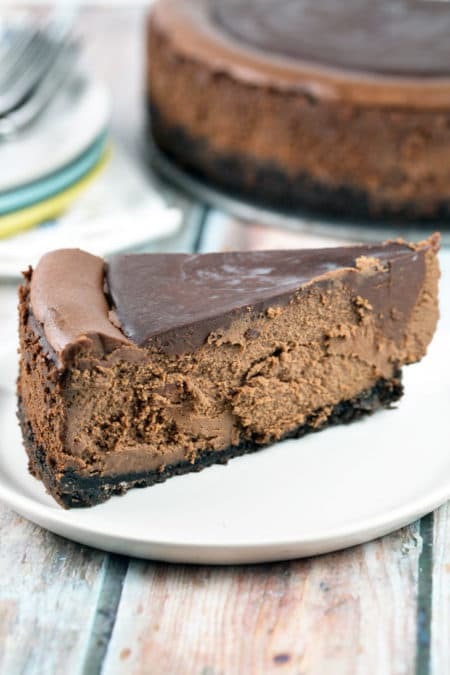 Today, we’re going in an easier… darker… chocolatier direction with an oreo cookie crust recipe. 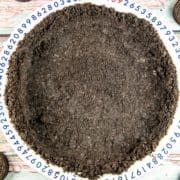 Oreo cookie crusts are super easy to make at home, but there are a few tips and tricks necessary. Have you ever tried one and found that it was super greasy? Or maybe a cookie crust that was so dry, it immediately crumbled? It’s important to remember that this recipe is for stuffed cookie sandwiches. It doesn’t have to be Oreo brand, obviously (looking at you, Hydrox or JoeJoe’s! ), but it does require a frosting filling. And only one layer of filling! Double Stuff oreos need not apply. The appropriate amount of frosting in the sandwich cookie plays a big role in making sure your cookie crumbs are appropriately hydrated. Using chocolate animal crackers instead of Oreos? You’ll need more butter to hold everything together. Accidentally bought “Double Stuf” Oreos? You need to use less butter, or else you’ll wind up with a greasy crust. So keep in mind, this recipe calls for chocolate sandwich cookies with a regular amount of frosting! Okay, now that we have the technical details out of the way, let’s talk about how dang easy this is! 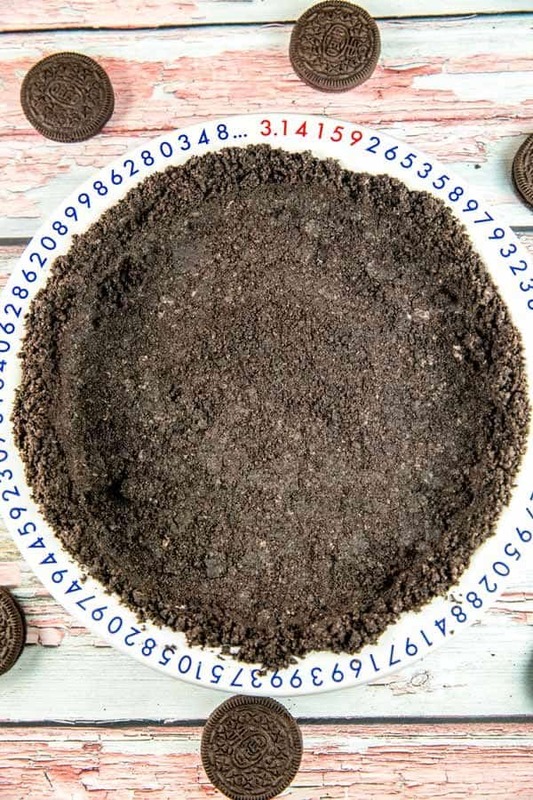 So easy, my 2.5 year old made this oreo cookie crust by himself! He likes to push the button on the food processor, so we grind up all our crumbs that way. No food processor? No problem. 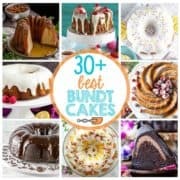 Grab a gallon sized freezer bag and a rolling pin or a heavy frying pan, and start smashing. 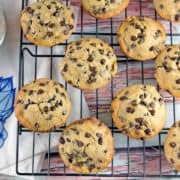 Once all your crumbs are finely processed to the point that you can’t see any chunks (and can’t distinguish between cookie and frosting), you’re good to go! Melt your butter in the microwave and mix in the cookie crumbs. Once everything is thoroughly mixed, dump it into your pie tin. No need to grease the pan – the butter in the crust takes care of this for you. You can do this hand if you prefer, but I find a metal measuring cup or the bottom of a small juice glass works even better. Really squish those crumbs in there! 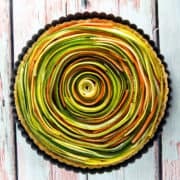 You should get a very compact crust along the bottom, but the sides will be a little looser, especially if you’re dealing with a deep dish pie crust. 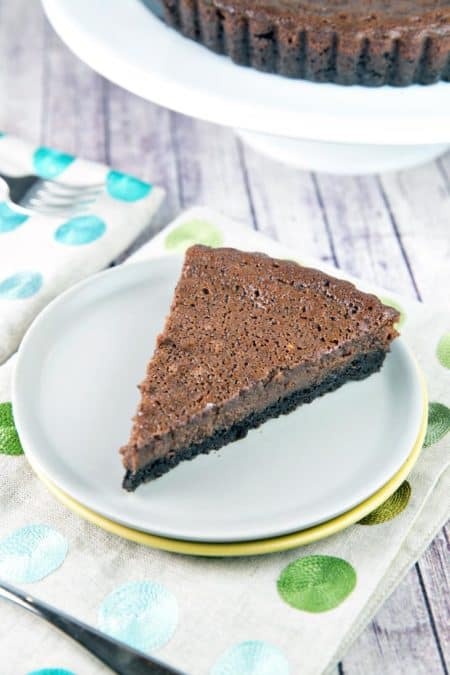 Whatever you bake/chill in the oreo cookie crust will help hold the sides together. 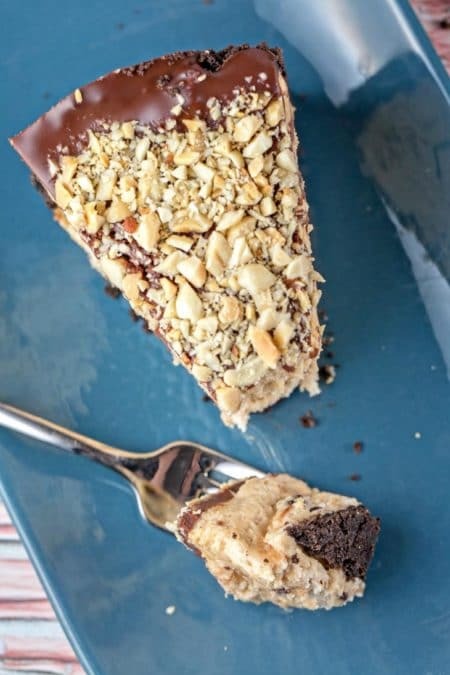 A cookie crust always gets a little crumbly when you cut it, but most of it will stay together! 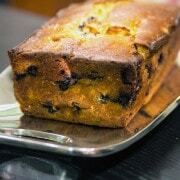 As far as baking the crust or not: totally up to you! 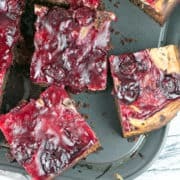 This can be a truly no bake pie crust. After pressing the crust into the pie plate, you can chill for 20 minutes to solidify the butter, or bake it at 350 °F for 8 minutes to set the pie. The baked crust gets a little crunchier, which I tend to prefer, but there is no need to bake it for structural reasons. If you’re doing a baked pie, you don’t need to par bake the crust: just pour your pie filling right on in. See? Super easy. 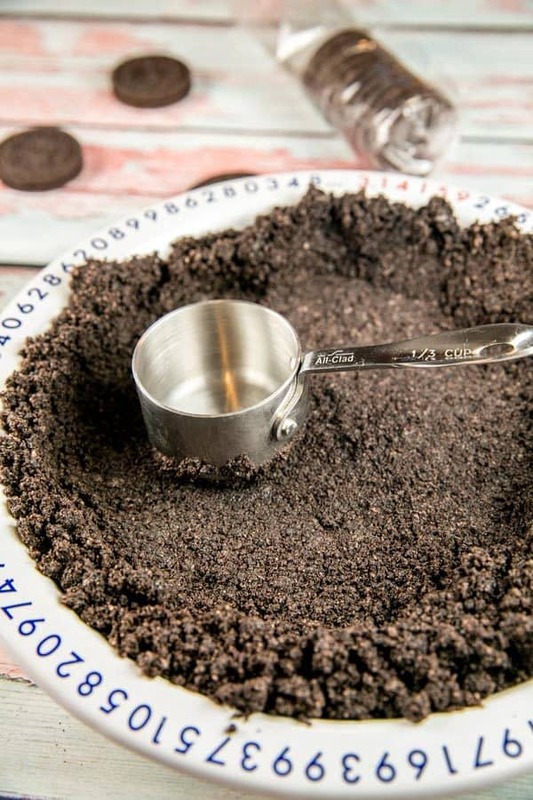 No need to ever buy a store bought Oreo cookie crust again – make your own whenever you want one! 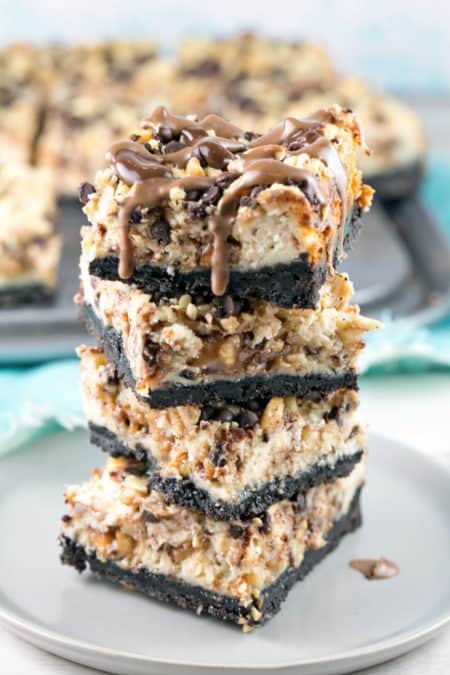 Start crushing up those Oreos – it’s time to make an easy, no bake, homemade Oreo cookie crust! Skip the premade crusts and make one yourself with just oreos and melted butter. 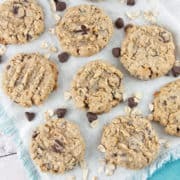 Finely crush the chocolate sandwich cookies, using either a food processor or a rolling pin or heavy pan to crush cookies in a gallon-sized freezer bag. Melt butter in a large microwave safe bowl. Pour cookie crumbs into the bowl and mix to combine well, until crumbs start to stick together. 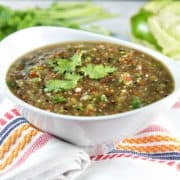 Pour crumbs into pie pan and press down along bottom and sides of pie pan, using either fingers or the bottom of a measuring cup or juice glass. 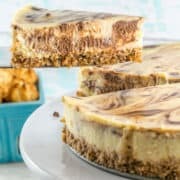 Refrigerate for 20 minutes for a no bake crust, bake at 350 °F for 8 minutes for a slightly crunchier crust for a no bake pie, or bake after filled with pie ingredients. 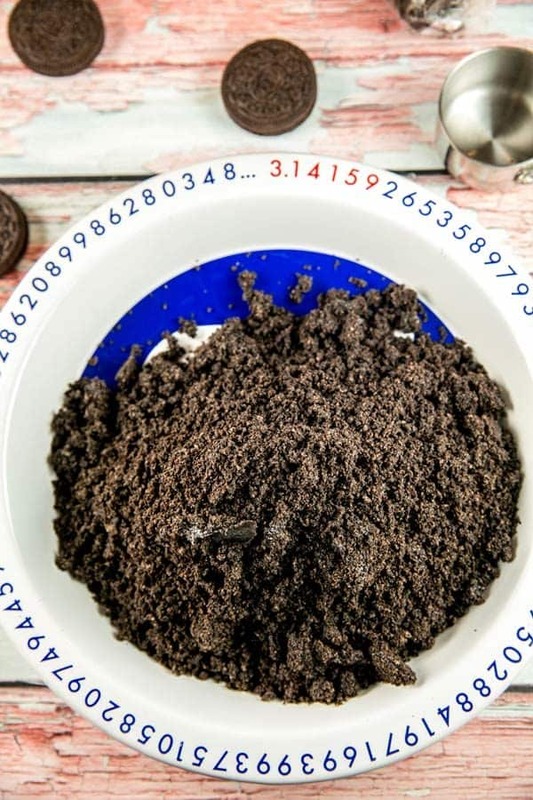 Making an Oreo Cookie Crust? Here’s what you should do with it! So glad to find you ! This is perfect way to include my son into the process ! Thank you so much ! I just realized your pie plate is a PI plate. Ha! Love it. Yes, yes and YES. I have visions of Oreo cheesecake running through my head. I love your little helper. So cute!